The State of Ohio is making up for lost time in developing wind power, with the latest addition to the wind power portfolio being Iberdrola Renewables' 304 MW Blue Creek wind farm. The State of Ohio is abit late to the wind power party, but it seems to be making up for lost time in a big way. The American Wind Energy Association (AWEA) reports that in the last quarter of 2011, Ohio was the fastest growing state in wind energy in the entire nation, growing a stunning 929 percent in the quarter. The state, which receives over 80 percent of its electricity from coal powered plants, was starting from a very low base line of wind energy. 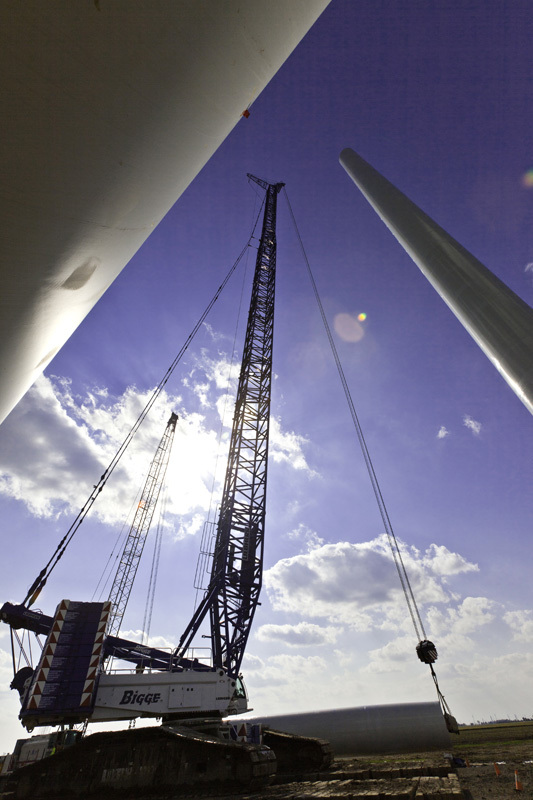 By year-end 2011, it had 112 MW of wind power, compared with only 11 MW at year-end 2010. The wind power numbers for this year are going to increase further, with Iberdrola Renewables' recently completed 304 MW Blue Creek wind farm (in the northwestern part of the state near the Indiana state line) adding substantially to the wind power tally for Ohio. Project developer Dan Litchfield noted that when Iberdrola originally conceived the project, it was actually going to be built in Indiana. "But we made the decision to move the project into Ohio, and the main reason was the AEPS," explained Litchfield. Called an RPS in other U.S. states, AEPS is Ohio's Advanced Energy Portfolio Standard, requiring that Ohio utilities achieve a 12.5 percent renewable electricity benchmark by 2025. The AEPS also requires Ohio's utilities to generate or acquire 50 percent of their renewable energy requirements from generation facilities located in-state, providing a further incentive for developing renewable energy within the state. Ohio-based utility FirstEnergy Solutions has already signed up to purchase 100 MW of the output from the Blue Creek project. Blue Creek may not have the very strong wind resource that is seen in other parts of the Midwest, but it has political support through the AEPS and—an extremely important point—there is easy access to the grid, through an American Electric Power 345kV line that runs through the site. Reflecting the large size of the Blue Creek wind project, it's been a number of years in the planning. Two predecessor companies, PPM Energy and Community Energy, started work on the project in late-2006. These companies were acquired by Iberdrola in 2006 and 2007. "We put up one met tower and filed an interconnection request into the PJM network at that time and followed up with additional met towers and interconnection requests in early 2007," explained Litchfield. The project gained momentum in 2008 with land leasing moving ahead. "The project consists of 27,000 acres of leased farm land, so it took a while for that to come together," says Litchfield. In general, the project was welcomed by local farmers. "Ninety-nine percent of the project area is corn, soybean, and wheat fields—from the farmer's perspective, wind is a new crop they can harvest." September 2010. Reflecting its size, the site straddles six townships in two different counties. While there is a solid business case for building the Blue Creek project, Litchfield noted that it differs from some of the more robust wind projects Iberdrola has done in other parts of the U.S.
"It's a class 2 wind site, so it is not one of the windier sites we've worked on considering that we've done projects in the Dakotas, Iowa, and Minnesota. But when the pace began to pick up with Blue Creek in 2008, turbine technology had come a long way. So we designed the project to be ready for taller towers and larger rotors, and ultimately, we installed Gamesa G-90 turbines, on 100 meter towers. Since this is not as robust a wind resource as we see in the upper Midwest, we're using a machine that is designed for this wind resource to make the project feasible." Unlike some of the other areas Iberdrola has worked in, which typically have ridges or some hilly topography, Blue Creek sits primarily on tableland. The site is extremely flat—and Litchfield emphasizes the "extremely" part. "A hill around the site would be about eight feet of elevation," he says. Most of the 152 Gamesa 2 MW turbines used on the Blue Creek project were built in neighboring Pennsylvania, so the transportation travel time to site was fairly short. That said, Blue Creek is also located on a wind channel with a healthy wind resource. "It's very wide open, and the wind really howls through there," says Litchfield. This part of Ohio used to be part of what is called the Great Black Swamp, which was an extension of Lake Erie, to the east. It was drained and settled in the second half of the 19th century. "The farmers have an extensive network of drainage tiles to drain the farmland, to make it more productive," Litchfield explained. "That was a bit of a challenge for us with installing our underground cable. "That drain tile network is the lifeblood of this area," he said. "How we were going to deal with the drain tile system was the number one, number two, and number three concern of every farmer that was considering a wind lease." Iberdrola had to develop a plan to repair any drainage tiles that were disturbed by construction of Blue Creek. The company installed a total of 97 miles of underground power lines, and during the process, carried out 15,000 drainage tile repairs. "That is by far the most drainage tile work we've ever done for a project—and that was just for installation of the collection system." Much of the drainage tile is very shallow, due to the clay soil. Some of it was also impacted by heavy construction activity, and Iberdrola is repairing that as well. "We're spending millions of dollars on drainage tile with Blue Creek," says Litchfield. "The farmers had a lot of concerns at the beginning of construction, but they're very happy with the way things have progressed, what we've repaired so far, and what we're going to repair in 2012." Since Ohio is fairly heavily populated, Iberdrola had a large group of landowners to deal with; about 280 landowners total, including landowners adjacent to the wind turbine sites. That large group of landowners meant a large communications effort, says Litchfield. "We put a big team effort into communicating with the landowners. One of the key things was we had a local office on Main Street in the nearest major town, Van Wert. People knew they could just drop by and ask questions." Their construction site management team was in the field throughout the project and was available to answer questions from landowners and locals. They set up a dedicated website, www.iberdrolarenewables.us/bluecreek, where the company posted all of its permitting documents. The company wanted to be as transparent as possible and communicate that the project was going to be compatible with residents and agriculture. "To date, we've only received a small number of complaints, and most of them were related to television reception, which we fixed." Unlike some previous Iberdrola wind projects, there were more questions, due to wind power being fairly new to Ohio. 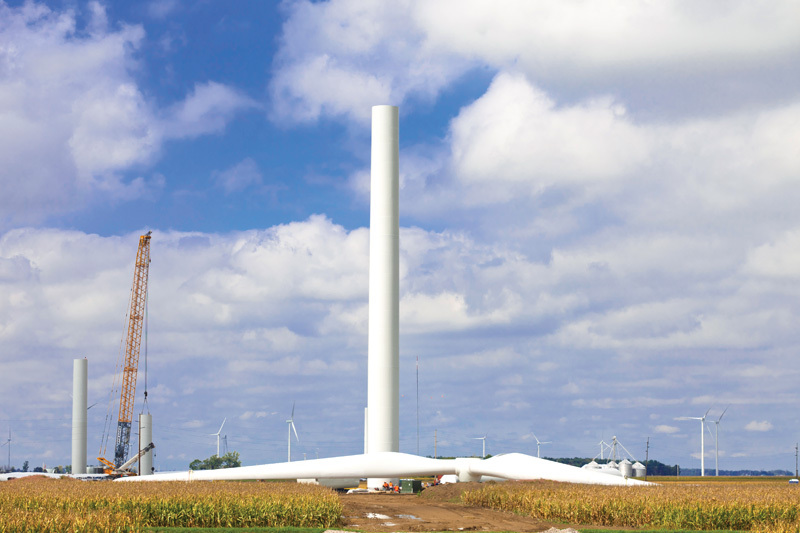 "Blue Creek was the first large scale wind project to start construction in Ohio," notes Litchfield, "and we are the largest wind project in the state. Although there were five other projects approved ahead of Blue Creek, we were the first to make it to the finish line and start construction." Compared to big wind power states like Illinois or Iowa, there was a bit of an education process with local residents and regulators on what to expect with a utility scale project. And the company was very interested in allaying any concerns. "It's a new industry for Ohio, and the State of Ohio wanted to make sure it was done right. It was a very thorough permitting process, and we had to change some things along the way. The result is a project that is absolutely compatible with the residents and the primary use of the area, which is agriculture." Although the project process went through two governors, representing the two political parties, it received solid support. "I think it's fair to say that throughout the process, we've seen bipartisan support for our project and wind energy in general," said Paul Copleman, communications manager for Iberdrola. 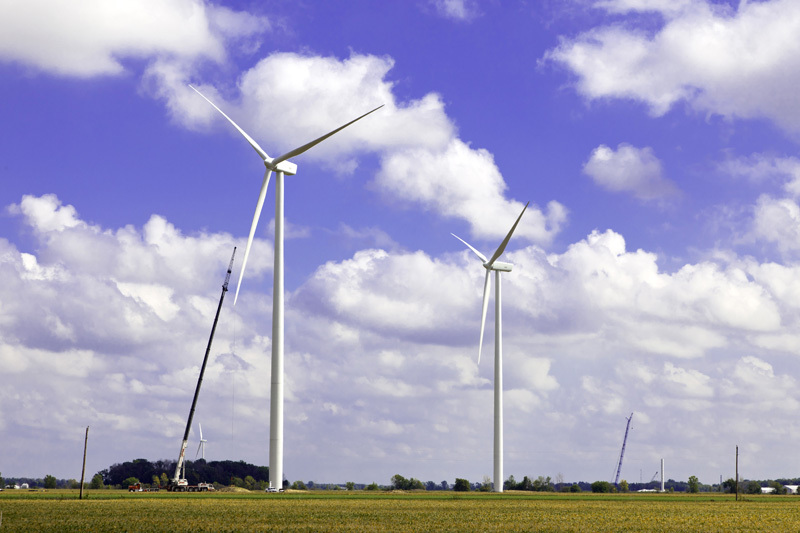 "The message that has been clear to us is that Ohio legislators are interested in the economic development that wind projects are proven to create in their communities," he added. Counties and towns that have been hit by the economic downturn and a resulting drop in taxes can see major benefits from a wind farm. In Van Wert County, where 75 percent of Blue Creek is located, Iberdrola will be the largest single taxpayer—larger than the next 14 businesses combined. In addition to the 300 jobs created during construction, it will create 15 to 20 permanent, high-paying technician jobs.. Being the first major wind project in the state, it is understandably generating a lot of interest. "This area is more densely populated than places with wind farms in the Dakotas, and the wind farm gets a lot of windshield visibility—we're right on the border with Indiana, and Fort Wayne (with a population of over a quarter-of-a-million people) is very close by, so there is a lot of traffic, and people are curious," said Litchfield. To help explain what the project is and how it works, Iberdrola, with the help of the Governor's Office and the Ohio Department of Transportation, installed an information kiosk at a rest stop on U.S. Route 30, about 300 yards from two of the turbines. Included in that information are details on the environmental studies that were carried out in advance of building Blue Creek. Avian studies were done, as were raptor searches and bat monitoring. "We also did a mussel survey for some of the streams and creeks that run through the project area. We found some mussels, and we relocated them upstream to make sure they were protected," explained Litchfield. He added that the underground power lines go under streams and creeks, rather than being trenched, for protection of stream life. Even though wind farm development is just starting to gear up in Ohio, the company was able to find the skilled trades people they needed fairly easily. "But it was a workforce new to wind power construction, so there was a lot of training that needed to be done with the specialized work." The good news about wind projects, Litchfield added, is that a lot of the work is general construction. They have truck drivers hauling concrete and gravel, and heavy equipment operators doing the civil work with bulldozers and excavators. To help kick-start the training that will be required for wind power technicians to maintain wind turbines in Ohio, Iberdrola made a financial contribution to the Vantage Career Center in the town of Van Wert, which provides trades training. The Blue Creek site is fairly close to major highways and rail lines in the region, which made it easier to transport construction materials, heavy equipment, and turbine components. That certainly helped, because with 152 turbines and 100 meter towers, there were 10 oversized truckloads per turbine, making for a total of 1520 oversize truckloads that were delivered to the site during the summer of 2011. Some of the components were delivered by rail to Van Wert and trucked in from there. Most of the Gamesa 2 MW turbines were built in neighboring Pennsylvania, so the transportation travel time to site was fairly short. Iberdrola negotiated agreements with the townships to make sure the roads were protected. The company spent $2.5 million upgrading county and township roads ahead of construction. "The roads we used have been repaired and are now in better shape than when we started," says Litchfield. Blattner Energy was the Balance of Plant contractor on the project and was responsible for the access roads, foundations, and turbine erection. PAR Electrical Contractors Inc. was the electrical contractor and installed the collection system, underground lines, some overhead lines, and the two substations. At 304 MW, Blue Creek is the largest single-phase wind power project Iberdrola has done in the U.S., and a solid team effort was required to complete it successfully, says Iberdrola's Paul Copleman. "It comes down to putting together a great team that can handle the responsibilities that go into such a large project, the roads, the rail, the 152 machines, and more concrete—100,000 cubic yards—than we've ever used before on a project." Success comes down to "miles added on my car," added Dan Litchfield. "It's driving to the site and spending time in the community. This is a new type of project for this region, and there were a lot of questions about wind energy." Now that a lot of those questions have been answered, Iberdrola is looking to add further wind power to the region. The company has plans for another wind project, Dog Creek, which they hope to bring online in three to five years. The project, which would also be about 300 MW, would share the substation that was built for Blue Creek. Other projects are planned in adjacent counties as well.